Post a review/recommendation on your blog, FB, Twitter, Goodreads or Shelfari pages. Include the title, author and name of the series so that other Series Sunday participants can add the book to their TBR lists. 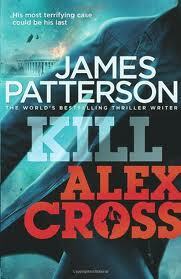 My Series Sunday pick is Kill Alex Cross, the 18th book in the Detective Alex Cross series by James Patterson. The President's children have been kidnapped. The Washington DC water supply has been poisoned. Together, both cases are a devastating attack on the United States. And Alex Cross is the detective handling both cases. Every new Alex Cross book is labeled "the most gripping." This one? Not so much. Was it better than the last few Patterson books? Yes. But it was missing the suspense, mystery and murder factor. It is still worth the read though. It is available in U.S. bookstores and online retailers November 14. However, you can read the first 27 chapters here for free.